UPDATE: Due to a scheduling conflict with the studio, these sessions have been moved from Saturday, November 9th to Sunday, November 10th! 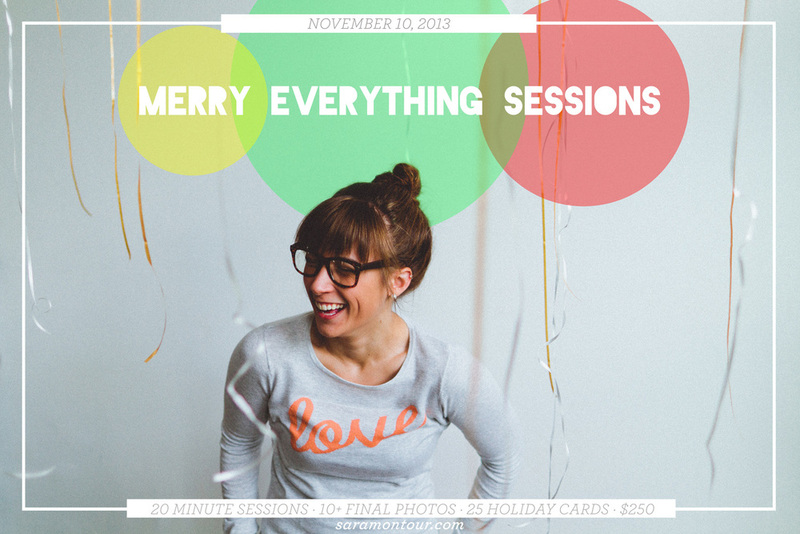 I've been dreaming of doing some super modern, creative holiday photo sessions inside a studio for quite some time and I'm beyond excited to announce that it's finally happening! Think: gorgeous natural light studio. white walls. concrete floors. charlie brown trees. popcorn garland. tinsel. silver + gold. clean lines. modern design. you, wrapped in christmas lights. Don't think: CHEESE! Red. Green. Snowmen. Reindeer. Santa hats. Forced smiles. *if holiday cards aren't your jam, I would love to swap them for an 8x8 bamboo wall print for you instead! I'm only doing these dreamy sessions for one day and couldn't be more excited about them. I'm so ready to create some beautiful + bright + inspired art and would love to create it WITH YOU and your family/kids/boyfriend/girlfriend/best friend/pet. Please email me at sara@saramontour.com ASAP if you're interested, so you can snag one of the spots and be a part of this fun day!